This week’s way to save $100 per year is a no-brainer for many of you. In fact, some of you probably haven’t seen the inside of a coffeeshop in years. But I have a pretty good idea that a number of you are regularly frequenting your local coffeeshop — and it’s probably making a fairly big dent in your wallet. Relax! You Don’t Have to Give Up the Coffeeshop Habit Completely! Don’t worry! I’m not going to say that you can’t ever step foot in a coffeeshop. I think it can be a fun treat on occasion, but you’ll save a whole lot of money if you can learn to make the stops at the coffeeshop an occasional treat rather than an almost-daily habit. How Much Can You Save By Making Coffee At Home? The Simple Dollar estimates that the cost of a 16-oz. brewed at home cup of coffee will cost you no more than $0.50 to $0.60 each, including the cost of energy, cream, sugar, etc. When I calculated it myself, I was coming up with the same costs for high-quality coffee. If you get a good deal on the coffee beans, your savings is going to be even higher. So, if you’re typically paying $1.50 per cup of coffee, that’s a savings of around $1 per cup five times per week — or $20 per month or $240 per year. If you typically pay $4 for a fancy cup, you’re saving at least $17.50 per week, $70 per month, or $840 per year! Crazy, eh? After lots of practice, I’ve learned how to make coffee at home just exactly how Jesse and I love it. In fact, we both agree that I can brew a better cup of coffee than any coffee shop we’ve visited. I personally love Starbucks Breakfast Blend, Starbucks Pike Roast, or Avodah Mocha Java. Experiment and try different blends and kinds until you find one you love. Or, just purchase what you typically drink at your local coffeeshop. It’s probably going to cost quite a bit more than some off-brand at the grocery store, but it’s worth the extra cost if it means you’ll actually make coffee at home! There is a huge difference in taste and freshness when you grind your own beans. And coffee bean grinders are very inexpensive to purchase (you can pick one up at Walmart for around $20) and so worth it. The French Press makes coffee much more flavorful. It’s totally worth the investment (you can pick one up at Target or Walmart for around $20 to $30) — especially compared to a regular coffeemaker. However, don’t go invest in a coffee bean grinder and French Press unless you are sure you will actually use them on a very regular basis. Consider borrowing these items from a friend, if you know someone who has these on hand and isn’t using them. Or, you might check your local thrift stores. Coffee Recipes: How to Make Your Own Homemade Latte Without an Espresso Machine and Homemade Pumpkin Spice Lattes. Do you make coffee at home? If so, what tricks and tips do you have for making a really amazing cup of coffee? Love this idea. And for us stay-at-home/ homeschool moms, it just makes “cents” to make coffee at home. We have several nice thermal mugs, so we usually make and take our own coffee on trips too. Sometimes we even fill up at the hotel before leaving. But when I fly, I use my Starbucks card (from swagbucks) for a special treat. We use the Brueggar’s unlimited coffee tea or soda. We go there at least 5 times out of each week. It’s only $139 for the year and we live less than a mile. There is a drive thru so we don’t even have to get out of the car. French presses come in different sizes. Ours makes eight cups so sometimes we have to brew more than one pot. They do have larger ones though. The French Press only makes a few cups at a time… so it’s not necessarily ideal for a big group of people. I recommend coarse grind for a French Press because it’s much more flavorful. If you like starbucks coffee (and have one near you), and you buy their whole beans (from grocery store or their shop), they will grind the coffee beans for you free – to your specifications based on what kind of coffee pot you use (french press, cone drip, flat bottom, etc). Although it wouldn’t be fresh ground every morning, you could get it fresh ground say once a week. Peets or some of the other coffee shops probably do that also if you buy their coffee. Personally, I got tired of cleaning the pot, etc. so I bought the cup at a time pot that goes into my car tumbler. Even on weekends I use it with the lid–nosey cats stay out and if I spill, oh well. I do want to get some Joulies–saw them on Shark Tank and thought they were super cool. Silly question … but has anybody figured out how to get lipstick off of the Copco reusable plastic cups? No matter what I do, mine has a permanent stain on it, and even though it’s clean it looks gross. I wish they would make a brown or black lid for their cups, but in the meantime I would love to know if anybody has a sure-fire way to get the color off. I would love to know that too! One of mine is stained with tinted lip gloss. The only thing i knew to do was use a Brillo pad lightly in that spot only which helped. SOOO agree, but that way no one uses my cup with the pink “sleeve”, I have to use straight cleanser to get it cleaner, but still not perfect and I am kind of a nitpicker for white being white. If you want to splurge on a travel mug, I got one from Longaberger baskets that is made of pottery with a black lid. It was more expensive, of course, but no stains and my husband doesn’t like drinking out of plastic, so it works……..
That’s what I was thinking, but I’m not sure you want a Magic Eraser touching where you’re going to be drinking out of! Oh, I would wash it again in hot water and soap after that! It should be okay after that. Or a combo of vinegar and dawn dish soap. Did you try baking soda? I keep a little shot glass of baking soda in the cupboard where my glasses are & just stick a wet finger in it & then use my finger to scrub whatever needs cleaned- a stain on the countertop, something stuck on Pyrex dishes, etc. This worked with food coloring on my counter when making cupcakes this weekend, so maybe it will work on your lipstick stain! 🙂 Good luck! How about a pumice stone? Have you tried Barkeeper’s Friend? That removes all sorts of marks from dishes and pots. We don’t drink coffee, but I drink hot tea every morning. I order it from England. Even if I have to pay shipping, it’s still cheaper than buying coffee or those K-cups people are so enamored with. Barkeepers friend worked like a charm. Thanks Anne Marie! I’m still going to sanitize it by running it through the dishwasher, though. I have owned my own espresso machine for the past 7 years, it has saved me a fortune! The best part is that my lattes taste even better than Starbucks. I am actually disappointed when we travel and I have to get coffee out, it is not as good as at home. On the other hand, I tried baking my own bread per your money-saving suggestion last week. DH and I decided this will not save us any money as we eat so much more bread when it tastes as good as homemade! Normally a loaf will last a full week in our house, the one I made yesterday afternoon is gone already…oops! I like this series, thank you! What type of Espresso machine do you own? I have been interested in purchasing one. Would love to hear any tips on what to look for in a machine. It’s a gaggia carezza. I am not sure if they still make that one. At the time it was $200 but considering I have made 1-2 lattes/day since it paid for itself very quickly! Check out wholelattelove.com, that’s where I bought the machine and there are lots of reviews, demos, etc. I’m guessing it’s a stock photo. I’ve never seen a tablecloth on Crystal’s dining room table. If you run out of things to iron, would you come to my house? 🙂 I dislike ironing but like things pressed. I never iron, either….and I didn’t even notice the placemat was wrinkly. Things like that go right over my head! I would add to use really good, filtered water. We are avid coffee drinkers and can tell a huge difference when the water is exceptionally pure. Love coffee!! Yes! My husband worked at Starbucks, too, for a short time when he was in grad school. He says the water at Starbucks is triple-filtered, so even if you just get tap water there, it’s very pure. I’ve been making my own mochas and lattes at home for about a year now and I really can’t taste any difference. My version is super simple though. I heat milk on the stove and add instant coffee to it. If I want a mocha, I add a spoon of nesquik. It tastes really good! What brand of instant coffee do you like? 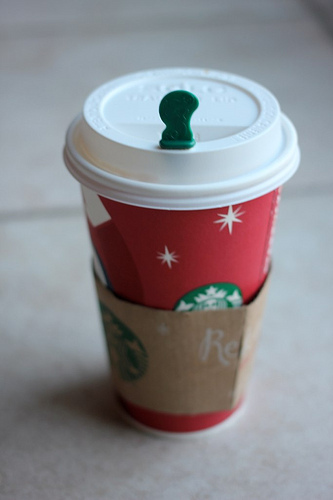 I really like peppermint mochas and Starbucks zebra mocha but they are so darn expensive. Honestly, I just buy whatever is on sale. Usually the generic but this time I’m trying Folgers since there was a deal. What is a zebra mocha? A zebra mocha isn’t on their menu but it’s a combination of their mocha and white mocha. The white mocha is much too sweet for me, but the 1/2 mocha really balances out the sweetness of the white mocha. Homemade caramel is so amazing and with chocolate together it’s even better. We don’t drink coffee ourselves but we do have family members who will come and visit about once a month and I make coffee for them. I was able to purchase a french press for a good price at Ikea a while back and it is so nice to have make just enough coffee for one or two people. Wow, what a great idea! For non-coffee drinkers, a French press would be a great alternative to a coffeemaker for hospitality. Smaller, cheaper, and easier to store and clean. Good for you! The Contigo travel mugs are amazing too! You can literally turn them upside down and nothing spills out of them. On top of that, they keep things hot for hours! I picked one up at a Costco Scratch-and-Dent outlet near our house, and I’m so glad I did. You can throw them in your purse, gym bag, or diaper bag – they’re really that good! If you are a professional klutz like me, get yourself one of these things! I love the Contigo travel mugs! They do keep things hot for a long time, with no leaking. On my route to work there are two Starbucks in the vicinity, but just far enough out of my travel direction that it makes it easy to avoid. I might be more tempted if they were easier to get to! However we do brew from home in both a regular 12 cup coffee maker and with a Keurig. That gives us the chance to try random flavors at a fraction of the cost! I take my coffee in a Tervis mug and then reheat it after I get to work. And although it sounds funny, you are right…..my coffee ALWAYS tastes better in my snowman tall mug. Even in the summer….I use my snowman mug! My husband and I have over the past year or two turned into home-brewed coffee drinkers, and now I prefer it to any coffee shop drink! We love iced coffee, so we brew a large pot of coffee a few times a week and keep it in a carafe in the fridge. I like to add some stevia and some real (meaning full-fat!) cream to mine… the flavor it adds is totally worth the 60-80 calories daily! My best suggestion for those who like flavored coffees is to splurge on a bottle or two of Torani flavor syrups. They are available at the website or on Amazon for $6-9 a bottle and you only need a pump or two for a large coffee cup so they last a long time. I love the sugar free french vanilla, and the sugar free english toffee. Even with that added expense, our savings are still HUGE on an annual basis of no longer frequenting coffee shops or donut stores for flavored iced coffees!! Thanks for the great post! Too funny, I haven’t been in a coffee shop in, well, forever. I just like plain black brew. Nothing special. Anyway, my mom got me a Starbucks gift card for Christmas and I decided to stop by today and get some after I dropped my daughter off from school! I used to go to the Starbucks inside the grocery store after getting groceries as my treat to myself and pick me up while trying to get running done but I started the habit when I was babysitting on Saturdays but when I stopped babysitting I didn’t stop the habit! Recently we’ve been tightening our belts so some months ago I stopped getting coffee. I walk by every week and longingly at it. Sure I know how to make my own mocha but it’s not quite the same. About the only time I go now is when I have the kids in tow because they have this non-caffeinated double chocolate sort of drink I can bribe the children to ‘STOP TOUCHING!’ for. I get a small for them and have them split it into 2 cups and then get me a mocha so I don’t hang my children by their toes. We love mochas. My husband bought me a stove top espresso maker for my birthday a couple of years ago. We buy monin dark chocolate syrup by the case so we don’t have to pay shipping and now we rarely go to a coffee shop. The stovetop espresso makers run anywhere from $20-$100, and they work great especially if you want a real espresso taste. We make our coffee at home every morning, I set it to start before we get up. I’ve found that the better my coffee the less “stuff” I need in it. I’ve gotten accustomed to black coffee, to the point I actually prefer it in the morning. Saves money and calories. I do Pinecone Research surveys, and usually use the money from that as a treat to a nice coffee. I’m not sure that I could ever manage to like black coffee… but kudos to you! Anyway, I save way more than $100/year by not drinking it at all! Yeah, I have NEVER had a cup of coffee in my life (I’m 26). It doesn’t even appeal to me! When we got married 4 years ago, I remember saying to my husband, “Ugh, I don’t want to register for a coffeemaker b/c we will only use it for guests!” Thankfully my SIL gave us hers when she moved…it’s still going strong 4 yrs later (we only take it out every 2 months maybe?). 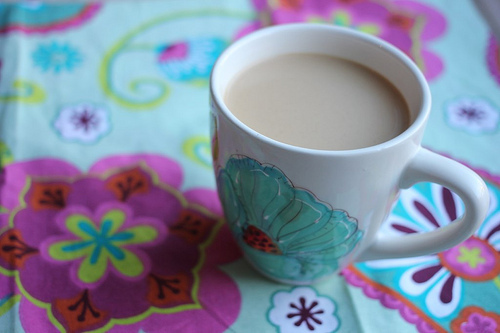 I use a french press also and I love using Sam’s Club organic coffee, I find it is easier on my tummy. I use stevia to sweeten and milk. If I want to make it fancy I add in chocolate syrup (homemade) and a drop of peppermint extract for a peppermint mocha taste. Oh and I also agree that a good mug make all the difference. I actually bring mine into the coffee shops because I don’t like the taste of coffee in a disposable cup. I’ve never been a Starbucks or coffee every day kind of girl. I would enjoy the occasional Starbucks about 1-2 times/month only during the winter months (Nov.-April or so). I haven’t been to Starbucks yet with my gift card as I’m enjoying experimenting with the Keurig. Love iced coffee drinks so much that I will freeze coffee into ice cubes! I linked one recipe to my name here. We make all our own coffee’s at home, including Americano’s, Latte’s and Chai. We use our espresso machine at home for coffee, sometimes a french press, and sometimes an aeropress (my hubby likes the aeropress much more than the french press, by the way). Costco sells Tazo chai brand concentrate in a 3 pack for around $7.50. Each one makes about 5 cups of chai (mix with hot milk). At Startbucks, a grande chai is just under $4. You can see how it saves a lot! Stores like Ross sell frothers for $3…buy one of those to froth your own hot milk before adding in the chai and it will taste just like one made at Starbucks! Also, making your own simple syrups for the lattes will save a lot too. It’s really just equal parts sugar and water in a pot on the stove, and then a little extract of the flavor you want. We store ours in the fridge. Totally agree with the ‘use a cup you love’. I do that with water and find that I drink a whole lot more when its in a cup that I like. Oh, I should find a water cup/glass that I especially love — great tip! Here’s a good recipe for a mocha mix. It came from Fly Lady. I normally drink my morning coffee black, but occasionally like a mocha or some other fancy drink. This is a good mix to keep on hand. 1 cup instant coffee. Fly Lady recommends Tasters Choice, so that’s what I use. 3 cups instant milk. Fly Lady recommends Carnation. Mix it up and store in an airtight container. To make your drink, boil water and add 3 tablespoons of mix per 8-oz cup, more or less to suit your taste. As with all grocery items, you can get these ingredients inexpensively if with a sale and a coupon. I have brewed my coffee at home all my life. I drink half of my 12 cup carafe every morning. I used to drink expensive brands until about 5 years ago when I discovered Aldi brand coffee. It is the best tasting coffee and it is all I drink. It has recently changed labels to “Specially Selected”. I buy 2 packages per month, place them in the fridge to retain freshness, and brew my coffee daily. They just raised the price to $4.99 each but that still means I’m only spending under $10 per month for my coffee and it is seriously the best tasting coffee around. I agree! Aldi’s coffee is great! I could not agree more with all four points! The twelve ounce bags of Starbucks sold in grocery stores can also be redeemed for a free tall coffee at Starbucks. Target runs giftcard deals semi-regularly on these. Combining gift card deals with coupons and sale price, I typically pay $5 a bag AND save the bag for a free cup later on. Almost every Saturday morning my husband and I go on a date at Starbucks. We each get a pastry and a cup of coffee in a “for here” porcelain mug and since we’re gold card members we get free refills. We use one empty coffee bag to get one of the cups for free and have a really great face-to-face date for less than $7. This is cheaper than a movie or dinner and we have great conversation! Grinding your beans really does make a difference! I LOVE Trader Joe’s breakfast blend it’s organic and a good price. I buy it with whole beans and grind it with my magic bullet. That’s another option instead of buying a coffee grinder. We make our own coffee and I do miss it when we are out! I especially love to sweeten it with raw local honey and I think that is what I miss most when we are at coffee shops that just have fake-o honey. – French Press all the way! They have them for $10 at Ikea and the one we got is just as good as our other Bodum press (we like to have two so when we have guests we can make regular and decaf). But my favourite place to buy French presses is garage sales! – I don’t know about the US, but Canadian Costcos have Organica brand coffee, which is organic, shade grown and delicious (my Dad is particular about his coffee and he says that it is the best he has found). Also, more affordable than Starbucks beans. – I like Starbucks, but when we do treat ourselves, we like going to our small local coffee shop. Delicious coffee and it supports a local company (and they happen to have slightly lower prices than Starbucks, as well as a rewards system!). Gift certificates to that shop make great Mothers and Fathers Day gifts for my husband and I.
Oh. Forgot to say that if you like to keep a pot warm, but have trouble with the French press cooling off between cups, I made a super-simple cozy for it and that has solved that problem! Very basic sewing and very nice results! The “How to make your own homemade latte without an espresso machine” post that Crystal linked to at the bottom of this post has changed my life! I owe Modern Mrs Darcy big time as I have saved a ton of money using my Aeropress this past year. Also having a frothing tool as she suggests really adds to the luxury feel of the at-home latte. I have discovered though, that if you put chocolate in your milk it does not foam 🙁 It takes a little time to make coffee this way, but I find time to get it put together before getting the kids in the car and getting going to daycare/work every weekday. I love sitting at my desk enjoying my frothy latte – much better than what is offered by my employer! Oh yay! I’m so happy you found that article to be so helpful! I use the same method. I always add the chocolate or syrup to the hot espresso and foam the milk straight. We also get a few uses out of the AeroPress filters. I’ll have to try reusing the filter Jen, though usually my aeropress gets cleaned right before I make the next cup (just keeping it real!) so not sure if that would work, but I sure am going to try that! I am the only one who drinks coffee and I only drink one cup, so I found that the Keurig works well for me! I got a great deal on it from Kohl’s. Most K-cups I have bought have been around $0.40 a piece so probably about $0.50 after I add creamer and a touch of sweetner. My husband bought me Starbucks Peppermint Syrup for Christmas, so I add a shot when I want an extra special cup. Use a Aeropress! It makes the smoothest coffee you have ever tasted. My husband makes Americanos, and I’m more of a Mocha or Latte gal. I make my own syrups. And we always use filtered water from the Brita. My husband uses cheap coffee (Aldi) during the week and treats himself to the good stuff on the weekend (TJs or local beans). I usually go out for coffee once a week because I like to support the local businesses. Crystal is so right here – my hubby and I really prefer my coffee to most coffee shops. I think a lot of it is that you become so used to a certain taste that you train your taste buds to enjoy it. So, if you do this consistently, before too long, you’ll probably like your coffee the best too! Forget the french press and graduate to a pour over cup of coffee all the way. If the water is too hot your beans are scorched and your coffee is not as good. You just need a Hario dripper and a cone filter to go in it. I do recommend quality beans. Less mess than the pres also, just throw away the filter when you are done. You can buy different quantity drippers. (BTW, they will do a pour over of whatever roast you like at Starbucks on request!). we brew at home…hubby onlystops to get some only if he does something like leave his thermos on a jobsite, grr. I am kind of a weirdo in that I don’t like my coffee hot but I absolutely adore iced coffee (yes, even in the winter!!) 🙂 A friend turned me onto the process of cold brewing coffee and it is sooooo good! Very smooth, not at all bitter and best of all it does not get watered down. I also make my own vanilla flavored syrup so I can have my fave drink of all time, an iced vanilla latte. It is my treat mid-morning when I need a little extra energy to make it through yet another history lesson, lol! I prefer ice coffee so the girls at my job make a large pot of coffee in the mornings and then when turned off, I use the remaining coffee to make iced coffee at the office. I keep ice in our work freezer and I have sweetner and cream there also. I still treat myself to Starbucks on the weekend but I can have my coffee during week too. we brew our own coffee every. single. morning. we’ve been doing for YEARS. we only head into a starbucks or dunkin donuts as a special treat or if we are out of town. i enjoy my coffeehouse coffee that much more when we have it infrequently. i also love waking up to the smell of fresh brewed coffee. we set ours up the night before & set the timer. i love relaxing on the weekends, at home, while the kids run around and my husband and i enjoy our coffee. i am always amazed by the people we know who have invested in both a one cup machine (i.e. keurig) even a normal coffee maker and don’t use them! they get a cup on their way to work everyday! what a waste of money, in my opinion. it’s amazing how a $2.00 cup or even at $4.00 (fancy) cup can add up over a week or a month, plus all those extra calories in a those $4.00 cups! this is an easy no brainer to cut out of budget if you need to cut back! We use a stove top perculator that I forgot about until recently for regular coffee and buy the creamer we like. The perculator makes the coffee just as flavorful as the french press and we love it! We got rid of our expensive Delonghi coffee maker. 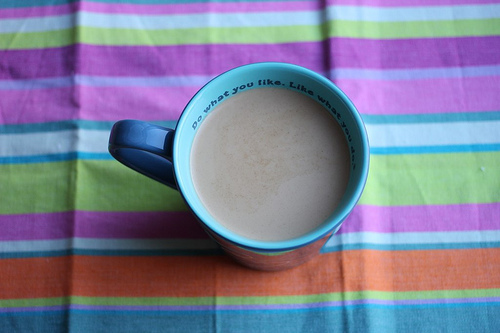 For my white mochas, I bought a Mr. Coffee latte maker…it’s so easy and tastes so good! They are only $79.99 at Costco and it definitely pays for itself in a month, especially if you go to Starbucks everyday. All you do is pour the milk and syrup in the caraffe, it will heat and foam it up while it makes the coffee and drips it in. Little to no effort on your part. Pour it in your $1 to go cup from Starbucks and add some whip, it looks and tastes just like Starbucks white mocha. I was waiting for someone to mention a stove top percolator! That’s my coffee brewing method of choice. I grind my beans fresh every day and it is the best coffee! Love the “Do what you like” mug! Do you remember where it came from? Yes, it’s from Life is Good. They had a sale through Zulily around Christmastime and I picked up some things for a few in my family who love Life is Good products, plus a mug for myself and two of my good friends. Unless you find a sale on a deal site like that, it’s usually quite a pricey brand. Crystal, have you ever tried a Europress? Similar to a French Press, but rather than pressing the filter down through the coffee, you press the coffee through the filter. I love it! And since I’m the only coffee drinker in our family, I keep my Europress and all supplies (including a small grinder) in a small sterilite container under our kitchen sink…yay! I haven’t tried it, but I’ve heard raves about it from others! We make coffee every morning. We grind it fresh. If anyone lives in the area of Shoprite grocery stores, their own brand of whole beans is usually at least 2 dollars a bag cheaper and it is really good! We have been making our espresso drinks with an inexpensive stovetop espresso machine made by Bialetti for years. Evidently it is how the Italians make their espresso at home. They are available from Amazon and last forever. For a latte I just microwave the milk and add it to the coffee. The trick is to make sure the grind is correct – not superfine like Turkish coffee, but not coarse either. I prefer Starbucks but can’t always afford it. Trader Joes coffee is not bad for the price. Definitely better than grocery store, so that makes a nice alternative if you are looking for something less expensive! Wacky as it sounds, I didn’t really like making my own coffee until I got rid of all my coffee mugs and started using those travel mugs instead. They keep it warm and I have the right amount of sugar and cream down pat! We LOVE our burr grinder and aeropress. The aeropress is similar to a french press, but makes a smoother cup…and they are only $25 on amazon. For my homemade latte I also froth milk with my $5 frother from ikea to give that great bubbly texture that coffeeshop lattes and cappuccinos have. While I love these ideas…what about those of us who have the Keurig? I try to get the best deals as possible. With my regular coffee maker, I wasted so much coffee. With the k-cups. I make just what I want and don’t waste anything…no one likes old coffee, right? So anyone here have the “my k-cup” – it looks like it defeats the purpose of having these k-cups, but what do y’all think? I have a Keurig, a french press and a 12 cup Cuisinart for when I have company. I had the “my k-cup” and didn’t like how the coffee tasted. I also tried the solofill but wasn’t a fan of that either. I do love the ekobrew reusable filter. I have 4 of them. I bought 2 on Amazon and then found them in TJ Maxx for a few dollars cheaper. My husband and I really like the Starbucks Breakfast Blend. I purchase the whole bean coffee at Target and they “coarse” grind it for me. (I haven’t yet invested in a coffee grinder but I may after this post). The coffee from the Keurig using the ekobrew filter actually comes out with a tiny bit of coffee foam (I know there’s a name for this, but I forgot) and in my opinion tastes better than Starbucks. At night and on weekends, I love using my french press with the same coffee but use my capresso frother to make specialty lattes. I also agree with Crystal and finish off with a fancy mug. My husband bought me a Starbucks coffee mug and a plastic reusable tumbler for iced coffee and my lemon water. This finishing touch personally makes everything tastes better and feels fancier. The cups may have been a bit on the expensive side but totally worth it after all the money we saved and the satisfaction of making my own coffee and lattes for pennies. Thanks again Crystal!!! oh great! i will have to check out the ekobrew. thanks. Heather, I have the Keurig Vue and it is great for days when I don’t have time to make a pot of coffee. To save money, I like to go through ebates to a company selling the pods. I cannot wait for a MYVue option as my coffee tastes far better than the ones we can buy. I am infamous when it comes to coffee. I am never without it. I used to grind my own beans, but that got expensive. I tried to quit coffee/caffeine, but I love that smell first thing in the a.m. I did quit caffeine, but everyone got me coffee for Christmas and not a bit of it was decaf! So, I bought a big can of Great Value decaf (WalMart) and for a 4 – 5 cup pot, I use 2 heaping scoops of the decaf and 1 scoop flavored coffee. There’s a tad of caffeine, but the flavor is all there! If I really want a Starbucks, I use a gift card. People know me well, so I get one for a holiday or birthday, then stretch it out as long as possible! My favorite is Iced coffee. I have found a great tasting, easy way to make it. I add two scoops of my favorite brand (anything mocha) and 8 cups water. When it is done brewing I add 2 T. of a sugar free creamer (vanilla or peppermint mocha) and several drops of liquid Stevia. I use 8 drops of stevia clear and 8 drops of english toffee or chocolate raspberry. Let the coffee cool in fridge, drink with lots of ice. Not only does it taste good but I am not adding all the sugar in my drink. I go to Starbucks once in blue moon, last time was on a Mommy/Daughter date. I got my special treat, she got a kids temp apple cider, and we had a special bonding moment, talking and drinking like I do with my friends. She loved it very much. One trick that I have learned is to add a pinch of sugar and salt to the grounds before brewing. It cuts bitterness and brings out the flavor. We also LOVE the Lavazza Crema de Aroma beans that I get from Amazon. On subscribe and save the price is awesome (especially if you catch it when it is on sale). I stopped using my keurig and went back to a mr coffee maker. A 30oz canister of folgers that was on sale for $5.99 is lasting me a month or longer. A 12 count box of k cups that you cant get for less than $8 here in Florida would last me 3-4 days. Huge money saver there. I always go to coffeeshop but I love sitting there to listen to music and see anything around happen to relax. However, to save money I agree that we should make our own coffee at home.